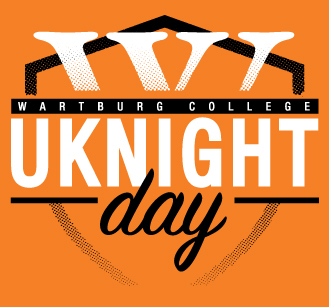 Join the whole Wartburg family in celebrating UKnight Day on Tuesday! Follow #UKnightDay all day on social media to share your love of Wartburg and see how alumni, parents and friends are celebrating and supporting the college. Give a gift of any size at www.wartburg.edu/UKnightDay and be 1 of 1,500 "UKnighted." All are invited to a Happy Hour from 4:30 to 7 p.m. Tuesday, March 27, at Joe's Knight Hawk. Stacey Snyder '86 will be hosting the event. Cost is $5 with appetizers, and a cash bar will be available. Please RSVP by noon Monday, March 26; walk-ins will be welcome, but your RSVP will help with planning. We encourage you to wear your favorite Wartburg gear on Tuesday! Thursday, April 5, 4 p.m., Loving God & Neighbor: Living Out the Biblical Call in the Holy Land, McCaskey Lyceum. The presentation will be followed by a reception in honor of Bishop Younan in the Castle Room. Friday, April 6, 5:30-6:45 p.m., dinner honoring Bishop Younan, Castle Room. Dinner reservations (free for Wartburg students, faculty and staff) can be made at this link. Following dinner, Bishop Younan will speak from 7-8:15 p.m. in the Chapel. This address is open to the public, and you do not have to attend the dinner to participate in the presentation. There will be time for Q&A. Due to Easter Break, the next edition of Juice will be sent Tuesday, April 3. The deadline for submissions is 4 p.m. Wednesday, March 28. Enlightenment Week is dedicated to shedding light on autism and those on the spectrum. If you are a future educator, occupational therapist, speech pathologist, music therapist, or anyone who might work with individuals on the spectrum in your career, this week is for your enlightenment. Check out the list of events below. Monday, April 2: Keep an eye out for the blue all over campus in the evening. Tuesday, April 3: Dorm Storm at 7 p.m. for the Autism Society of Iowa; wear blue throughout the day. Wednesday, April 4: Movie night with cupcakes at 7 p.m. in the Clinton Hall basement. Thursday, April 5: Panel of professionals at 7 p.m. in Grossman 131. See how people in your future field work with those on the spectrum. Friday, April 6: Sensory-friendly game night with Best Buddies at 7:30 p.m. in Cardinal Commons. The next Math, Computer Science & Physics Department Seminar will be Tuesday, March 27, at 11:30 a.m., in SC 134. Dr. Charles Figura, professor of physics, will discuss gravitational wave astronomy in a presentation titled Things That Go Bump in the Night: The Story of Kilonova GW 170817. All are invited. Refreshments will be provided. The Mail Center will be closed Friday, March 30, and Monday, April 2. Deliveries scheduled to arrive between those dates will be received and processed Tuesday, April 3. Click here to see the dining hours for Easter Break. The last meal in Mensa will be Thursday dinner; Mensa and all dining areas will resume regular hours Tuesday, April 3. All are welcome to attend a retirement celebration for Pastor Ramona Bouzard on Monday, April 16, at 3:30 p.m., in the Chapel. We will gather to sing PR’s favorite hymns and follow up with ice cream sundaes, cookies and lemonade till 5 p.m.
30 years: Tony Lutz, Shaheen Munir, Lori Poehler, Suzanne Torkelson, and Pat Wayne. 25 years: Dan Black, Karen Black, Jeff Hemingson, and Thomas Payne. 20 years: Kathy Dreesman, Chris Kelly, Michael Lavenz, Krystal Madlock, Keith McClung, David McCullough, Jennifer Walker, and Bill Withers. 15 years: Cynthia Bane, Tiffany Cooper, Jette Irgens, Chris Knudson, Scott Leisinger, Terry Letsche, Ed Westen, and Tara Winter. 10 years: Kory Figura, Jamie Hollaway, Samantha Larimer Bousquet, Byron Mather, Wendy Mohlis, Jason Steege, Colleen Ulrich, Ann Wrede, and Leilani Zart. If your name was omitted from this recognition list, contact Erica Sadler in Human Resources. Go to the Security Update on the InfoCenter to see updates on door locks, security camera installation, and LED lightbulb installation. Previous reports can also be found at this link. March 26-30 is Severe Weather Awareness Week in Iowa. On Wednesday, March 28, between 10 and 11 a.m., the National Weather Service will conduct a tornado drill. The purpose of this drill is to ensure Iowans can adequately receive a tornado warning and can practice any actions that would be taken in the event of a real tornado. Know the safe shelter areas in your buildings. Generally, go to the lowest level and stay away from windows and doors. Most tornadoes will move from the west, so have the most protection in that direction. If there is no place below ground level, go to an interior hallway on the lowest level of the building. During an actual tornado warning, Wartburg College will send out a WartburgAlert. If the warning period is extended, an interim message will be sent out and another one once the danger has passed. Student Senate will host the Faculty/Staff Appreciation Event on Thursday, March 29, 11:30 a.m.-12:30 p.m., in Hagemann Castle Room. The following award recipients will be recognized: Dr. Christine DeVries, associate professor of chemistry, John O. Chellevold Student Award for Excellence in Teaching and Professional Service; Dr. Lori Sheeler, visiting associate professor or public health, Outstanding Faculty Adviser; Krystal Madlock, director of multicultural student services, Outstanding Administrative Staff; and Steve Foelske, cleaning staff, Outstanding Non-Administrative Staff. There will be a brief program and remarks by DeVries at 11:45 a.m. Refreshments will be served. Human Resources has finalized the changes to the performance appraisal forms. The forms are now available on the InfoCenter under Employment, Forms and Procedures, Performance Appraisal Forms. Performance appraisals are to be completed beginning April 1 and submitted no later than June 30, generally covering the working period of June 1, 2017, through May 31, 2018. Direct questions to Human Resources. The Fall 2017 GPA Report and Executive Summary are now available on the InfoCenter. Direct questions to edith.waldstein@wartburg.edu. A memorial service is planned for Al Koeneman ’55, former vice president for development, at 11 a.m. April 14 in Wartburg Chapel, with lunch to follow in Knights Ballroom. Visitation will be 5-7 p.m. April 13 at Kaiser Corson Funeral Home. Al held multiple positions during his tenure at Wartburg from 1991 to 2000. He was a retired rear admiral in the U.S. Navy and served as Chief of Chaplains of the U.S. Navy from 1988 to 1991. He died Feb. 20 and is survived by his wife, Carol ’66. The top ideas that come from the World Café will go on to Phase 3 of the challenge and present during RICE Day on Thursday, April 12, from 10 to 11:15 a.m. in WBC 116. Thank you to everyone who entered! The Wicked Problems Poster Challenge will return next fall. Monday, March 26, depart at 9 a.m. for Cedar Rapids. Wednesday, March 28, depart at noon for Loras. Tuesday, April 3, depart at 11:15 a.m. for Simpson. The deadline for submissions each week is 4 p.m. Thursday. Send items to juice@wartburg.edu. Please keep your submitted item short—no longer than one paragraph—and let us know if your item is for students, faculty/staff, or both editions of The Juice. Direct questions or comments to Stephanie Boeding, Marketing & Communication, at ext. 8760. The Juice reserves the right to edit items for length and readability. Wednesday, March 28 – Pastor Ramona Bouzard, "Resistance to Craving and Violent Action"
There will be no Weekday Chapel or Sunday Worship services during Easter Break, Friday, March 30, through Monday, April 2. President Darrel Colson recently spoke at a one-day symposium, co-sponsored by the Gustav-Stresemann Institute and Wartburg College, in Berlin. The symposium examined German-American relations from 1848 to the present day and outlined the future of the transatlantic relationship. Colson’s speech, Luther, Bound Conscience, and the March Revolution, is posted on the InfoCenter under President’s Reports. Dr. Michael Bechtel, assistant professor of science education, presented Biophilia in the Classroom at the 2018 STEM Pre-Service Teacher Conference in Iowa City on March 3. The Wartburg women's basketball team ended its undefeated season Friday in an NCAA Semifinals loss to Bowdoin, 62-90, as reported by Waterloo-Cedar Falls Courier and the Des Moines Register. The annual Drag Show, sponsored by Alliance, was featured in the Waterloo-Cedar Falls Courier. The women's basketball team is being led into the Final Four by a group of Iowa athletes, as reported by KCRG, KWWL, and the Des Moines Register. Wrestling coach Eric Keller shared his excitement about leading his Knights to another national championship and the anxiety that comes just hours later as he looks forward to 2019 with the Waterloo-Cedar Falls Courier. The Wartburg women’s basketball team defeated East Texas Baptist, 65-61, to advance to the Final Four this Friday in Rochester, Minn., as reported by the Waterloo-Cedar Falls Courier, KWWL, and CBS/FOX 28. The Waterloo-Cedar Fall Courier reported on the Wartburg wrestling team’s 14th national title. At the National Championships on Saturday, the team also had three individual champions and two national runner-ups along with eight overall All-Americans. The women's basketball team talked about the team culture that has allowed them to find success on and off the court, as told by d3hoops.com. Tim Grove ’94 was featured on 60 Minutes for his work in Trauma Informed Care at SaintA's, a Wisconsin-based organization that provides innovative family-centered care and educational services that embrace diversity and empower children, families, and adults to improve the quality of their lives. Eric DeVos ’18 talked about his journey to this year's wrestling national championships and plans after college in the Waterloo-Cedar Falls Courier.